Gabriel Metsu (Gabriel Metsu, 1629, Leiden - October 24, 1667, Amsterdam) - a genre and religious artist of the Golden Age of Holland, one of the co-founders of the St. Luke's Guild in Leiden. Features creativity Gabriel Metsu. "Why buy Vermeer, if there is a Metsu?" - These words of the Paris art dealer of the XVIII century very clearly characterize the former popularity of the Leiden painter. During his lifetime and up to the nineteenth century, he was valued much higher than the “Sphinx from Delft”. In the XVII century, Leiden was famous for its fijnschilders, or "exquisite artists." However, their scrupulous glossy style began to gain popularity only by the time Gabriel Metsu moved to Amsterdam. He specialized in genre scenes, skillfully conveyed the play of light and shadow, as well as various surfaces - satin, linen, fur, ceramics, glass, skin tones. The master combined the formal language of his distinguished countryman. Gerrit Dowwith plots peeking Gerard Terborch. Gabriel Metsu managed to combine in his work the best of what his contemporaries offered. Famous paintings by Gabriel Metsu: "Hunter, dressing after swimming", "Sick child", "Vegetable Market in Amsterdam". Gabriel Metsu was born around the end of 1629. The exact date is unknown, but the historian Adrian Weiboer believes that the future painter was born between November 27 and mid-December. His parents were the artist Jacques Metsus (c. 1588 - 1629) and the midwife Jacquimne Garniers (1589/93 - 1651). Before settling in Leiden around 1615, Gabriel's father spent some time in Gouda, earning his living by creating patterns for tapestry manufactories. No works of Metsu Sr. have survived, and in the Leiden cadastres there are no pictures assigned to him. 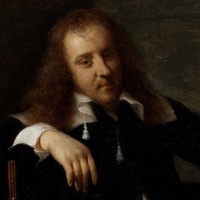 However, attributed panels began to appear more or less regularly only in the 1640s, and Jacques Metschou died in the 1629th in the inventories of citizens' property. Both parents of Gabriel came from South-West Flanders, but moved with their families to the Dutch Republic as children. At the wedding in Leiden in 1625, both were no longer young and had previously been married. Gabriel most likely was their only child, but Jacques Metsu had never seen his son since he died eight months before his birth. How many half-brothers and sisters Metsu Jr. had from other unions of his parents is difficult to understand. When in 1631, Jacquim Garniers appealed to the city council with a petition to issue a midwife's license to her, she stated that she was raising nine children. Although Adrian Vayboer believes that she could exaggerate to cause sympathy. In 1636, the widow married the fourth time - for the skipper Cornelis Bontekrai. He had enough money to provide both Gabriel and the other children of Jacmin. It is difficult to determine who taught Gabriel Metsu. Painter and writer Arnold Houbraken (1660 - 1719), author of the historiography "The Great Theater of Dutch Artists", does not mention this. Various researchers point to Gerrit Dow, but there is no evidence for this. Moreover, the influence of the founder of the “exquisite artists” school on Metsu’s creativity began to manifest itself only in the mid-1650s, when he was already working independently. The first example of influence is the panel. "Notary public"dated to about 1653 (compare: 1and 2). It should be noted that the strokes of Metsu are much freer than those of his illustrious countryman, and the color spots are almost abstract. Adrian Waiboer assumes that he received the first drawing lessons from Metsu from the silversmith Klaus Peters de Graebber from Harlem, who settled in Leiden around 1640. It is known that the 13-year-old Gabriel was in his service. One of the Klaus brothers was the famous painter Frans Peters de Grebber, the father of painters Peter franceand maria de grabbers. The latter was the mother of the future wife of our hero. Judging by the early famous works of Metsu, his next mentor was a master of historical painting. However, in Leiden there were few experts in this genre. These included Anthony Clausson de Grebber, son of the aforementioned jeweler. Some works of Metsu are so close to his paintings that the possibility of teaching should at least be taken into account. But if it took place, then not for long. Already in 1644, the entry “Gabriel Metsu, schilder” (“Gabriel Metsu, the Artist”) appeared among thirty-one names under the petition for the creation of the Guild of St. Luke. Of course, Gabriel, who was barely 15 at the time, was hardly an independent practicing artist. This line may indicate that colleagues recognized the young talent and the young man received the privileges of the master - a share in the teacher’s work and the right to sign his own works. When in 1648 the Leiden painters united with the painters and still convinced the city council to agree to the creation of the St. Luke's Guild, Metsu became its full member and paid contributions. In 1650, an inscription “vertrokken” (“dropped out”) appeared in front of the Guild's ledgers opposite the name of Gabriel Metsu. For a long time, historians believed that it was then that the artist moved from Leiden to Amsterdam. Later it turned out that the mark was added only in 1658, and before that the management of the Guild was carried out very badly, contributions came intermittently - if they did at all. However, shortly after 1650, 21-year-old Gabriel actually left Leiden. He went to Utrecht, where he worked for some time under the command of Nicolaus Knüpfer. Protecting the young man could make his countryman Jan Stenwho was a student of the Knupfer. After a short “Utrecht intermezzo”, Metsu returned to his hometown, but not for long. In the middle of 1654, he nevertheless moved to Amsterdam, where he remained until the end of his life. What caused the move, is not completely clear. Maybe cosmopolitan Amsterdam was more attracted to such an ambitious artist like Metsu. But maybe economic circumstances played a role: after 1652, the market in Leiden declined. And, as art critic Pete Bakker points out, the young Gabriel was not the only one who left the city - although he was one of the first. In Amsterdam, Metsu settled on Prinsengracht Canal, in a small house that belonged to a distant relative. From that moment began serious changes in the work of the artist. If in Leiden he specialized in religious scenes like "The Exiles of Hagar"then in a new place in a short time turned into a genre painter. It seems that it was in the bustling and noisy Amsterdam that Gabriel Metsusu realized and accepted his Leyden origin - here for the first time in his paintings you can see the influence of Gerrit Dou. However, he did not adopt to the end the elegant and time-consuming style of his popular colleague. Bright color accents that enliven the monochrome paintings of Metsu remind, rather, Nicholas Masaand fluid texture reflects impact Jan Baptista Venix, with the works of which he familiarized himself with in Utrecht. Most likely, the "retraining" was the result of an exact calculation. Replaced the pious poor like "Old Women for Food"(wine and bread hint at the sacrament of the Eucharist) came well-dressed young men and women who play music, exchange letters and gallantly flirt with each other (1,2,3). Street and market scenes are full of hints and ciphers. For example, plucked chickens and other game bear sexual connotation (1,2,3). Such paintings were much more popular with the wealthy public. And Metsu hurried to share a profitable niche with Gerard Terborch, By franz van mirisand Jan Vermeer. It is clear why the 18th century French people adored his paintings: images of exquisite life and sophisticated courtings anticipated work Jean-Baptiste Simeon Chardin, Antoine Watteauand Francois Boucher. On May 19, 1658, Metsu married Isabella de Wolfe of Enkhuizen. Her parents were Wooster Conraz de Wolff and the artist Maria de Grébber. Metsu apparently met them through the alleged former teacher Anthony Clausson de Gröber. He had gone to Amsterdam from Leiden two years earlier and testified to the marriage contract at the ex-apprentice's wedding. Isabeloften served as a model for her husband and, without any doubt, is depicted in many of his paintings. However, it is unlikely that she was an artist, like a mother. Gabriel Metsu died in the fall of 1667 at the age of 38, and was buried in the Calvinist temple of Nieuve kerk on 24 October. With his death, genre painting lost one of the most prominent representatives, whose work inspired numerous artists, including Jan Steen, Jan Vermeer, Franz van Miris and Peter de hoch. During the life of Gabriel Metsu was a trendsetter, and after his death, his star shone even brighter. Now it is hard to believe, but in the 18th century it was much more popular (and his paintings, respectively, more expensive) by his compatriot Jan Vermeer. The latter was even called "the artist in the style of Metsu". Most likely, the painters were acquainted personally. Since their work is often not dated, it is difficult to determine who influenced whom. There is no doubt only that both were inspired by the creativity of each other. Between the works of Metsu and Vermeer there is a great similarity, both thematic and technical, it becomes clear to anyone who sees a number of their pictures (Metsu - 1, 2; Vermeer - 1, 2). “The Forger of the Century”, Han van Megheren, successfully misled art critics in the 1930s – 1940s, using Leydenz’s panels as a starting point for his counterfeits “under Vermeer”. But by the beginning of the last century, collectors began to appreciate Vermeer above, and the merits of Metsu faded. Perhaps the role played by the proto-modernist moods of alienation in the paintings of the Sphinx from Delft or the evolution of the design to clear lines and interiors full of light. Metsu almost disappeared in the shadow of his colleague. In the 20th century, his last retrospective was held in Leiden in 1966, and the last monograph on it was published in 1974. However, in 2011, thanks to the efforts of Adrian Vayboera’s Ph.D., 40 paintings by Metsu were exhibited in Dublin, Amsterdam and Washington. The painter's fame began to revive.